my very old model whirlpool does not heat up and the element is fine. what else could be the problem and how do I fix it? Since you refer to an element, and absent any other information about your dryer, I’m going to clairvoyantly assume that you have an electric dryer. 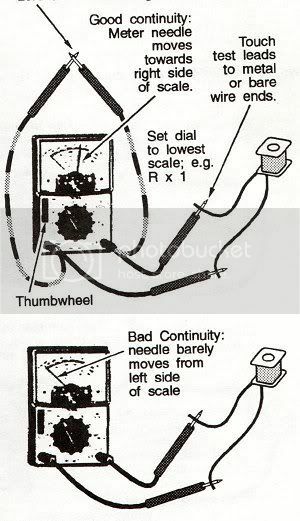 Before you even open the dryer, use your voltmeter to measure for 240v at the dryer wall outlet. You can’t just look at it and think it’s fine (I actually get people telling me that!) And just because the dryer motor runs, this doesn’t mean you’re getting 240v at the outlet, either. The motors runs on 120v but the heating elements require 240v and a common problem is for one leg, L1 or L2, of the 240v supply to open. 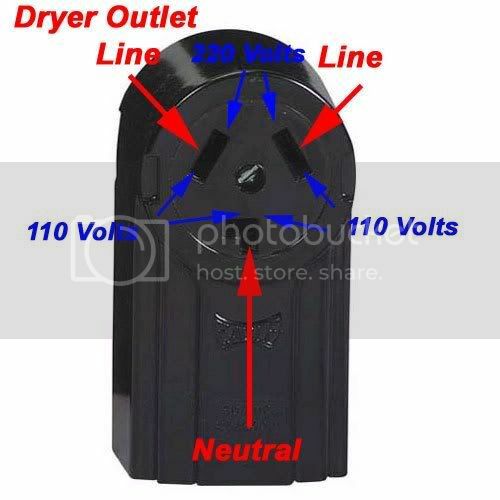 If you’re not getting 240v at the dryer outlet, you’ll never get the elements to heat up. Plain n’ simple. Whether you have a four-prong outlet or a three-prong outlet, you gotta check the voltage at the outlet with a meter! Ok, so you checked the voltage at the outlet and you actually measured 240v on your meter. Now, and only now, we turn our keen, laser-like attention inside the dryer. 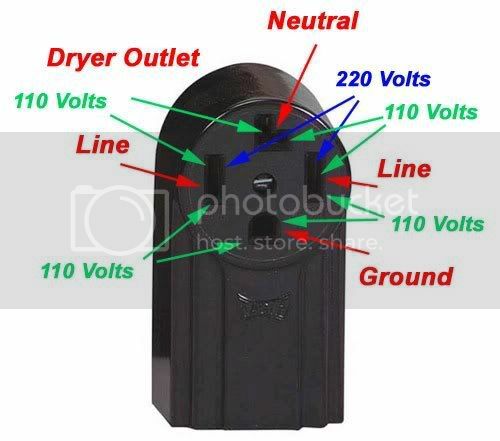 Let’s look at an example wiring diagram for an electric dryer. This one happens to be for a Whirlpool/Kenmore electric dryer and is probably very similar to yours. In the diagram, the heating element is shown in the lower right hand side. 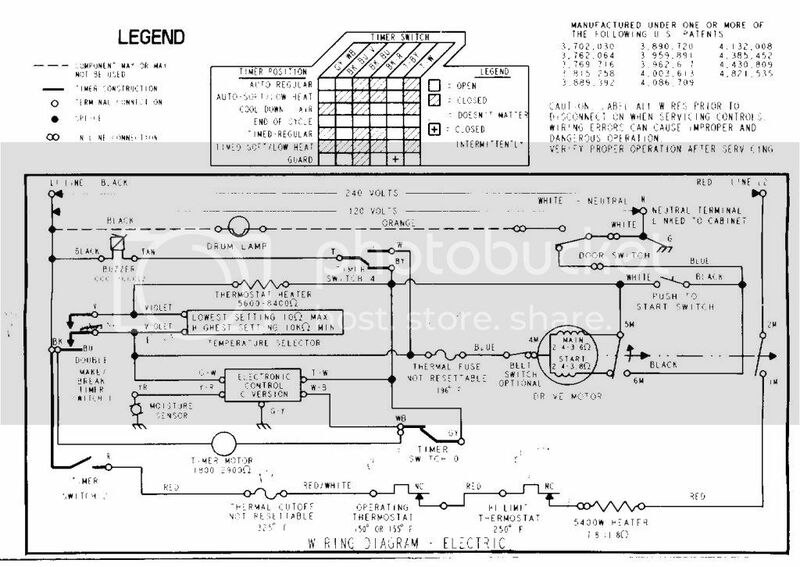 L1 and L2 are drawn on the either side of the diagram. The heating element connects to L1 and L2 through several different components. L1 connects to the heating element through the timer, a thermal cutoff, the operating thermostat, and the hi-limit thermostat. The heating element then connects to L2 through the motor centrifugal switch. All it takes is for any one of these components to fail open and this would prevent the heating element from receiving the needed 240v to get hot. Again, even though the example diagram is for a Whirlpool/Kenmore electric dryer, this is a typical configuration for any electric dryer. Although any one of these components can kill the voltage to the heating element, there are a couple that tend to fail more commonly and can be easily checked. A quick and easy test to do is to measure the continuity of the thermal cutoff, the operating thermostat, and the hi-limit thermostat. Do this with the dryer unplugged and your meter set on the Rx1 scale. Disconnect at least one wire from the component being tested to isolate it from the rest of the circuit. If you find one that’s open, replace it and problem solved! While you’re checking the continuity of these things, check the wiring for burnt or loose connections–this is another common cause for no-heat in electric dryers. If all those check out, then that leaves the the timer and the motor centrifugal switch. Easiest way to test the timer is to detach one lead from the heating element (doesn’t matter which one), run the dryer and measure for 120v out of the timer pin that powers the heating element circuit–in our example, it’s pin R. Measure for this voltage by setting your meter to the 150vac scale and placing one probe on timer pin R and the other on any metal point on the dryer frame. Oh, I know what you’re asking, “But if the heating element needs 240v, why are we only measuring for 120v at the timer?” The heating element gets its 240v in two halves: 120v from L1 and 120v from L2. We’re only looking for the L1 half at the timer so we’re looking for 120v. Finally, if the timer voltage checks good, then that only leaves the motor centrifugal switch which, if you’ve made it this far in your checks, you can safely assume is bad. Since the centrifugal switch is an integral part of the motor, this means you have to buy a new motor. A manufacturer’s repair manual and an AllenBar take a lot of the frustration out of this job. Ok, go fix your dryer! This entry was posted in Dryer Repair on March 15, 2004 by Samurai Appliance Repair Man.